Once the active period is completed, your braces are removed. The next step is called retention. Retainers are utilized to hold your teeth in their new position.You must wear your retainer as instructed, otherwise your teeth may move toward their original positions and the benefit of wearing your braces will be lost. Retainers should beworn indefinitely. They areusually worn at night and removed the next morning.Retention is an important part of your overall treatment and should not be neglected! For a brief overview of the different colors of retainers, please click on the image below. It will launch our flash module in a separate window that may answer some of your questions about different colors of retainers. Clean your retainers with toothpaste and cool water (hot or warm water will damage the retainer). 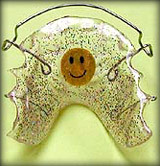 After meals, clean all parts of the retainer with a brush.